November 14, 2010. 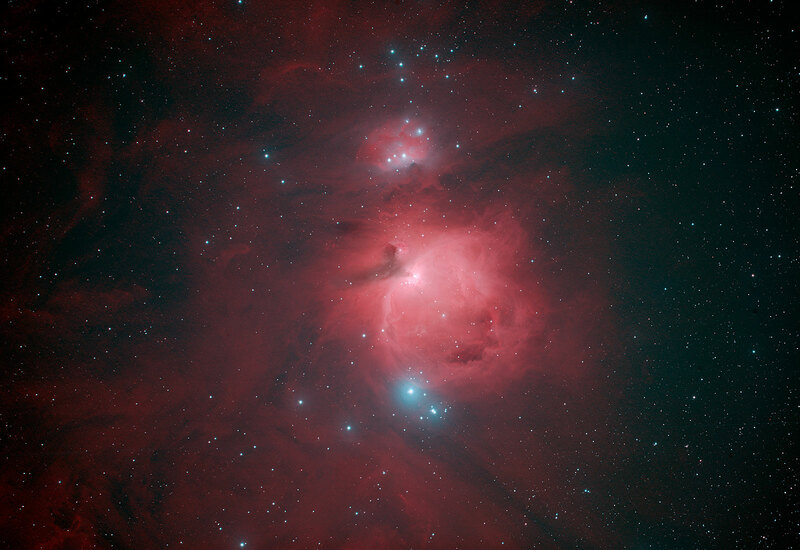 This is a cure for all of those great, but look-alike photos of M42 that one sees around the web. It sometimes happens that things go wrong yet there is still a happy ending. In this instance I could not get red images to suit me, probably due to thin haze that was reflecting diffuse light from reddish light pollution, so I used Hydrogen alpha (Hα) for the red channel. 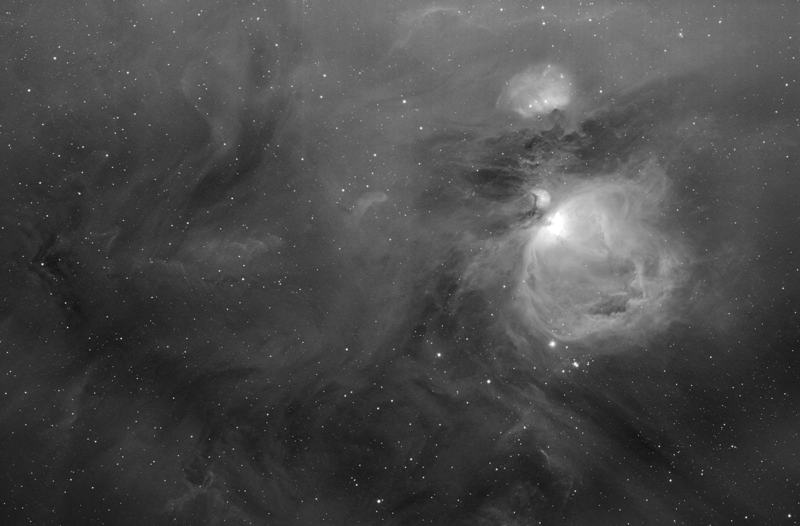 Then, knowing that I would not have time to get both the green and blue channels, I decided to go for the blue, which in my mind is more important for M42 than green, anyway. I was working remotely, controlling the Mac in the observatory from a Mac in the house, and I did not see the clouds forming. (I guess I need to get a sky-monitoring camera.) There were meant to be 16 five-minute blue exposures, but I got only six—just 30 minutes—and three of them were made through clouds. I used them anyway. That accounts for the soft blue haze surrounding the brighter stars. The upshot is that this photo was made with Hα, blue, and water-vapor filters—this is an HαBB photo. It may also contain traces of a satellite track that I did not completely remove in Photoshop. SBIG STL-11000M camera on a Takahashi FSQ-106ED astrograph. 80 minutes of Hα, 30 minutes of blue. Software: TheSkyX, Nebulosity, Equinox, PHD, Pixinsight, Photoshop, all running on Mac OSX Snow Leopard. November 18, 2010. Orion’s Sword is a familiar sight. The gas and dust visible here are part of the Orion molecular cloud, another part of which is seen here. I used a Takahashi FSQ-106 is working at its native focal length of 530mm. SBIG STL-11000 with Astrodon 3 nm Hα filter. All-Mac Image. This page is not yet indexed. Please visit Deep Sky 9 or select a link below.